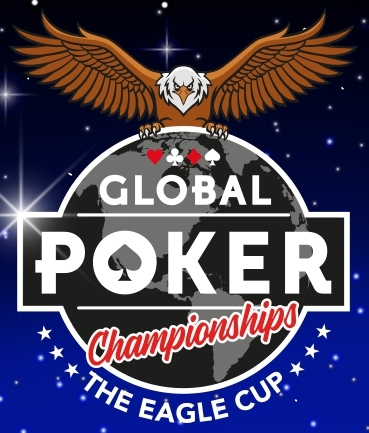 This Sunday, Global Poker will wrap up The Eagle Cup with a $218 buy-in SC$100,000 guaranteed main event. There are also two other main events, with buy-ins of $22, and $110. Other events slated for the final day of action include a $5.50 no-limit hold’em turbo tournament with SC$3,000 guaranteed, a $22 turbo with SC$7,000 gauranteed, and a $55 turbo with a $12,500 guarantee. The fastest growing site for US players upped the ante for this series with SC$750,000 in guaranteed prizes over the 135-event schedule, including a SC$5,000 opening freeroll event. Each Eagle Cup winner took home a Global Poker champions pack, along with a ridiculously large trophy. Anyone who finished in the top two in any event will earn a seat into the Tournament of Champions, which will award a player with a $5,000 live tournament prize package. If you’re ready to start winning, don’t wait, sign up for Global Poker today and get started playing. Join the action in the fastest-growing poker room in the world with Global Poker. If you have been around poker players in the United States lately then you have probably heard about Global Poker. The new kid on the block as far as online poker sites go has taken the poker world by storm. After launching, Global Poker has cemented itself among the top 10 sites worldwide for player volume and as the fastest growing site for US players. You can jump onto the Global Poker website and purchase a virtual currency called Gold Coins. You can then use these Gold Coins to enter into ring games, sit n go’s and tournaments. Gold Coins work much the same as play money chips on other poker sites, meaning that you can accumulate them and use them in different games but they can never be redeemed for real money. As a way to promote the sale of Gold Coins, players are given bonus sweepstakes prizes by way of $weeps Cash with every Gold Coin purchase that they make. The $weeps Cash can be used to buy into the $weeps Cash tournaments and ring games, however, any of these that are accumulated or won can be cashed out as real cash prizes.